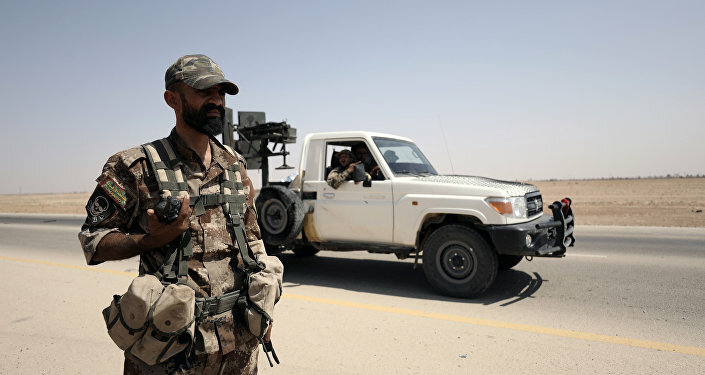 DAMASCUS (Sputnik) - Members of illegal militant groups in the city of Busra al-Sham (Bosra) in the southern Syrian Daraa province have started surrendering heavy weapons and hardware to the government forces, a military source told Sputnik on Wednesday. "Thanks to the efforts of Russian officers, which were mediating the talks between militants in Bosra [officially known as Busra al-Sham] and the Syrian army, the militants today handed over a tank, an infantry fighting vehicle and an artillery gun to the government. Before that, they handed over two other IFVs," the source said. Busra al-Sham is one of the most strategically important strongholds of militants in the south of Syria. The city is located between the capitals of Daraa and Suwayda provinces, some 12 miles from the border with Jordan. On Tuesday, the Russian center for Syrian reconciliation said that, over the week, 27 Syrian settlements had voluntarily joined the ceasefire regime in the provinces of Quneitra, As-Suwayda and Daraa. The situation in the south of Syria has escalated in recent weeks, with terrorists shelling the cities of Daraa and Suwayda and government troops responding by launching an offensive to oust the militants refusing to join the ceasefire.